Tread carefully when reading hyped books—- that’s what I always tell myself. The Cruel Prince is just that: hyped. Bookstagram was practically buzzing with it— before, during and well after its release. And I’m so glad that it did not disappoint. First, this one’s a total cover-buy. It’s gorgeous! Underneath the dust jacket, the book is just as pretty. I fell in love with it on sight. Next, the premise. If you’ve been hanging out here with me, you’ll know just how much I love my faerie stories. I just love everything about it— the lore, the otherworldliness, the complex nature of the fae. 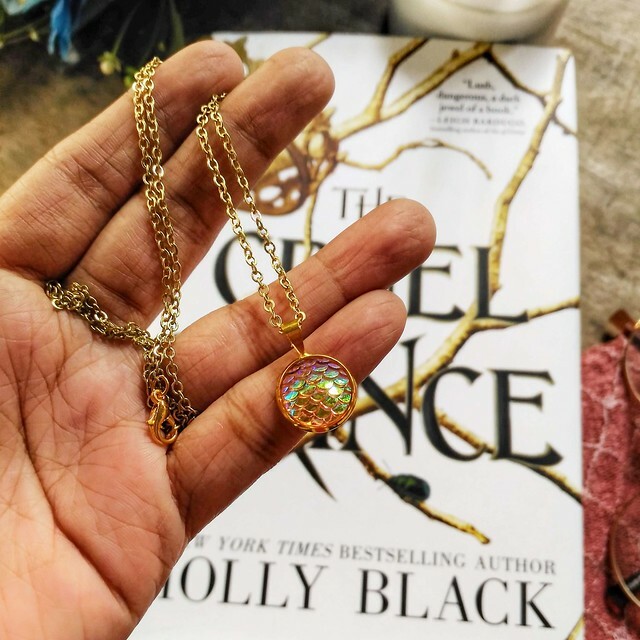 Holly Black, who’s known for her Spiderwick Chronicles, couldn’t have been better for this tale. She created a version of Faerie that’s just as cruel and colorful, but with a curious twist: she added a human girl like Jude into the mix. At first, I had a bit of difficulty understanding Jude’s motivations. She’s a human child spirited to faerieland. Raised by her parents’ murderer, she now desperately wants to be part of this cruel, twisted, magical world. And I had to wonder: why? Why bother to be a part of them? Why not escape? Why please your parents’ murderer and treat him like a father? Her complex relationships with the people around her was a lot to wrap my head around, and it made the story all the more interesting. I felt like I was getting to know her and her motivations with every turn of the page. And then there’s Prince Cardan. I heard a lot of people in the book community compare Cardan with Rhys from A Court of Thorns and Roses and that had me really curious. I hate to break it to you guys, but Rhys is like a 100x more better than Cardan, practically because Cardan’s just a kid. He’s a literal teenage fey, who likes to drink and be a moody bully. He does have his charms, though. I spent 80% of the book trying to figure him out and 20% of the book sympathizing with him. By the end of the book, I was at a loss for words. Ultimately, what I loved about this book is that it makes you think. It’s like one huge puzzle piece and you want to figure out which pieces fit with which. It’s full of complex characters and even more complex relationships. The story seemed to drag a bit at parts but compared to the rest of the book, it’s really a minor hiccup. All in all, I enjoyed this book a lot. Can’t wait to get my hands on the sequel, The Wicked King! Don’t have your own copy yet? Get one from Book Depository! They offer FREE shipping worldwide!